Soup, it does a body good. A recent source of fun and amusement (insert sarcasm here) in my life was the discovery that I have several food allergies. These allergies, it appears, have been responsible for some health issues I've head since I was in my twenties. I'm allergic to Gluten and Cow's milk. This makes eating out a challenge and definitely forces me to know what I'm eating. Needless to say, during the holiday, it becomes even more difficult to avoid either type of food. The long and the short of it is that a week after the holidays, I found myself at home, feeling like garbage. When lunch rolled around, hunger began to prod me to life a bit. I wanted hot, and hearty. With some brisket in the fridge, I whipped up exactly that. Soups are one of my favorite foods. They can be made with the simplest ingredients or the most complicated and be an amazing experience to eat. The key to me, to making a good soup, is the stock. Stock makes up the bulk of whatever soup you're making. If your stock is bland, you'll have to work too hard to compensate for it, which might result in an over-spiced bowl of soup. We often have our own chickens in the freezer. Farmer girl processes them onsite, so they aren't butchered, they're whole. No matter how we cook with the bird, there's a carcass left over. Throw the bones of a chicken or turkey into a large pot, toss in an onion or two, garlic and other veggie pieces, and then let it simmer for a good 12 hours on your stove and you've got it! They key, of course is all that time. It takes a fair bit of time to make a good stock, but it is really worth it. In my case, I often have smoked stock on hand. Doing barbecue, all of my meats are smoked to some extent, and that flavor carries over to chicken or beef stock. 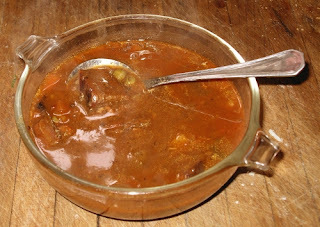 During my sick day, I used smoked beef stock to make a darned good beef vegetable soup. I have to admit that since I was a child, my idea of good beef veggie soup was Campbell's. As a result, the style of my soup tends similar flavors. I use a mix of root veggies: Potatoes, cut into quarter inch cubes, Carrots, cut into small cubes, several onions, chopped and garlic, also chopped. In addition, I usually add celery into the mix. I season the soup with salt and pepper and other flavors depending on whether I'm trying for an ethic feel (spanish, for example). But for the traditional style, I always make sure there's been some molasses added to it and some tomato paste. Those two elements are essential if you were a Campbell's fan! The result of my bleary-eyed efforts, was a thick, rich full tasting stew with hints of smoke and a deep flavor. It sure made me feel good.